So it may come as a surprise to read the full referent of that opening phrase: as Will Davies, one-time ideas man of the UK think-tank Demos, went on to observe, he was referring “not to civil rights or legal aid lawyers, but lawyers who can manipulate equity, voting rights, debt, share, audit and so on.” In seeing, he mused, “how far [these] can be tweaked in various directions, before they become something else…one starts to imagine a wholly different economy, simply through considering how freedoms, powers and responsibilities might be combined differently, via subtly redesigned legal instruments.” This window on the world of commercial law positions “public-spirited law” in unexpected ways, opening up the possibility of combining activism and business law. Both the potential and the limits of a juxtaposition between business law and activism are perhaps nowhere more vivid than in the surge of debate around the sharing economy. Notwithstanding the frequent appearance of the sharing economy in the pages of mainstream business magazines, there are a plethora of ways to understand the innovations being wrought by what is sometimes narrowly understood as “a set of technology-enabled practices that make it possible to reuse excess capacity.” I’ll return to this odd formulation below, but it is a classic instance of what Dan Gregory, in the August 2014 issue of STIR, termed the “narrow confines of extractive institutional models that focus ruthlessly on exchange value.” Gregory’s contention “that there is no such thing as capitalism” pointed to the extensive and expanding threads of non-capitalist activity that already braid our economic landscape and urged us not to forget the distinction between markets and capitalism. His call is echoed in the lively and eloquent plea by Gibson-Graham, Cameron and Healy to “take back the economy,” in a book that takes readers on a creative journey of reimagining labour, markets, finance and property through the lens of “community economies.” The sharing economy, then, is potentially as much a solidarity food co-operative as it is a private proprietary platform like FarmDrop, as much a community-owned renewable energy scheme as the energy investment platform Mosaic, as much a social enterprise bicycle shop as it is Uber. Of course, there are many important differences between the kinds of examples I list above. While they may share the capacity to disrupt current markets, the deeper systemic implications of how that disruption is institutionally configured are contested in a bewildering swirl of claims made for Hayekian self-organising spontaneity, Rifkinesque third industrial revolutions, and a dizzying array of commons-based visions for the sharing economy. Increasingly, however, it is by unpicking the diverse legalities that underpin specific concrete sharing economy initiatives that we can better understand their ability to drive systemic change. On one level, this has been happening already. The legalities of sharing economies have become an overt flashpoint of debates, certainly in popular media accounts on the blogosphere and in think-tanks like Nesta. Slowly they are also becoming the stuff of government enquiries: witness recent US Congress hearings and a reference to Spain’s government competition agency. But law is important in a much deeper way than the question of “how to regulate the sharing economy.” Although that matters a great deal, there is already a rapid tendency to frame the problem of regulation in all-too-familiar terms, stressing the appropriate balance between competitiveness and consumer protection alongside anxieties about the misuse of regulatory protection by self-interested incumbents. We can see these ways of framing the debate in a range of diverse recent settings, from the US Congress hearing mentioned above, the UK government’s response by the Department of Communities and Local Government to promoting the sharing economy in London, and a debate on the sharing economy by Australia’s Grattan Institute. Janelle Orsi, profiled as a Legal Rebel in 2010 by the American Bar Association, is an exemplar of a legal imagination that makes this odd juxtaposition obvious and central. A re-imagining of these legal laser beams is at the heart of what she calls “transactional law” in her pioneering work on the sharing economy. “To most law students and lawyers,” she says, “practicing transactional law isn’t an obvious path to saving the world…[but] transactional lawyers are needed, en masse, to aid in an epic reinvention of our economic system.” In her book, Practicing Law in the Sharing Economy, and the work of the Sustainable Economies Law Center she co-founded in Oakland, USA, she opens up a wealth of diversity in the ways law can structure transactions, and thus provide an infrastructure of exchange that moves beyond business-as-usual. Her work mixes a range of strategies to achieve this. She is creating new legal training pathways using apprenticeship structures combined with immersion in the social economy. She also runs a Resilient Communities Legal Café that provides affordable legal advice in a public collective setting that becomes part professional support but also part living classroom and community organising site. Finally, the Sustainable Economies Law Centre has, in collaboration with other new economy actors, sponsored successful legislative and regulatory change across a range of topics such as home food businesses, worker co-operative structures and peer-to-peer carsharing. She grounds all of her work in careful principled reflection on the ways in which law can reframe our modes of agreement, of constructing organisations and of building systems, inspiring others to develop a creative legal imagination about the possible ways forward—a path I hope to touch on briefly here. 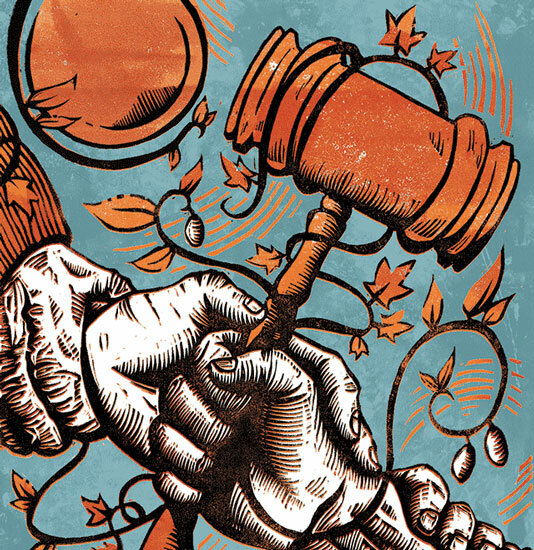 New legal structures that braid together profit and social purpose are increasingly available... This swirl of structural experimentation is stirring up conceptual rethinking about the legal structure of economic entities. What are the pathways our legal imagination can travel upon—care, harm and belonging? In 2010, Rachel Botsman and Roo Rogers published an influential account of collaborative consumption that has become a lodestone reference point in discussions of the sharing economy. They identified four structural elements that underpin the emergence of a collaborative economy: trust between strangers, a belief in the commons, critical mass and idle capacity. “Idle capacity” has always struck me as a jarring note in the context of those four principles. After all, without “idle capacity,” they could be describing a burgeoning social movement of the kind that more traditionally attracts the epithet “activist”: a critical mass of strangers, united by a passionate belief in the commons and a shared sense of mutual trust, charting new paths for the economy. Yet, as is now increasingly obvious, those new paths rapidly resemble the all-too-familiar extractive economy that sharing economy proponents hope or claim to transcend. But legality need not necessarily shoehorn the sharing economy into an extractive logic, even though it often does. We can reimagine its pathways, and Botsman and Rogers’ four elements are in fact an elegant place to start. It seems to me that the notion of reusing “idle capacity” is at the core of the need for reimagining legal tools. Although it is not the public face of the sharing economy, its image of sweeping up the excess energy, resources and goods of a wasteful society is a powerful one, and is in many way at the implicit heart of the claims to sustainability that sharing economies might foster. But if we pause and think about what actually makes this happen in legal terms, what are the legal tools that channel the activity of sharing, and turn time, goods and space from passive and unused to active and flowing, the question of the formal legal entity is central. This is the tool that channels the activities of sharing economy initiatives, the vehicle for spelling out who owns what and on what terms it can be shared. The private proprietary corporation may indeed have been the “special purpose vehicle,” as the legal jargon goes, of the extractive sharing economy—but if that is so, this form can be tweaked, pulled and pushed to animate imaginaries of belonging and commons, rather than exclusion and extraction. This is, as the pages of STIR often show, happening in multiple ways across many different jurisdictions. New legal structures that braid together profit and social purpose are increasingly available, from community interest companies in the UK to benefit corporations and low-profit limited liability companies in the USA to community contribution companies in Canada. And this swirl of structural experimentation is stirring up conceptual rethinking about the legal structure of economic entities, from Simon Deakin’s emerging efforts to reimagine the conceptual basis of the corporation as a commons rather than a nexus of contracts, through to Rory Ridley-Duff’s enquiry into communitarian perspectives on social enterprise. Botsman and Rogers’ second element, belief in the commons, is in many ways the much more public face of the sharing economy, evoking a resonance between gifts, common property and everyday notions of sharing. The irony of “the share” as a core legal element of private proprietary corporate ownership is a little bittersweet here, but perhaps at the heart of the slippage inherent in the practical manifestation of different versions of the sharing economy. For belief in the commons often leads, in particular contexts, to a blurring of the line between gift and contract in ways that complicate diffuse notions of collective sharing. There has been plenty of criticism of large-scale web platforms (of the kind that anchor many sharing economy initiatives) for the ways in which they depend upon and often exploit the gifted labour of their users. The sense that gifts are at the heart of a “business model” can also rub up directly against formal legal requirements. This happens particularly in the area of employment, in the context of volunteer labour and precarious work conditions, but also extends to finance, where crowdfunding designs push at the boundaries separating loans and donations. Some of the creative work being done here can draw on ideas developed around the design of intellectual property by “hactivists” embedded in the open source movement. In relation to this element in particular, it is important to appreciate that legality might take a range of potentially elastic forms beyond the confines of formal-rational state law. In response to the legal conundrums thrown up, the legal categories are being constructed by the everyday routines and evolving custom of sharing economy initiatives. Often operating in the interstices of existing—and inadequate—positive legal forms, Burns Weston and David Bollier have described this as “vernacular law.” It appears as an emergent form of lawful life that tries to redefine or rearticulate customs around exchange, with as little reference as possible to an existing formal-legal system that throws up numerous barriers and which treats “grey areas” as a disabling risk. Vernacular legalities allow space for ambiguity, slowing down, and a greater centrality of social relations and collective dialogue. It may be that a sense of care, a dimension of ethical interpersonal relations, is crowded out by positive law. But the interaction of the other core elements of a sharing economy initiative becomes important here. On the one hand, positive law can literally enact strictures of care and responsibility when it restructures formal legal entities into more democratic, horizontal and generative forms. And on the other hand, we should not forget that legalities also play a crucial role in preventing harm; indeed the “police powers” of the modern regulatory state take this as axiomatic. From this angle, all law appropriately substitutes for interpersonal trust. Botsman and Rogers’ third element, however, belies this, stressing instead a principle of “trust between strangers.” In many practical settings of sharing economy initiatives, the need for trust is actually significantly bracketed by technology, through identity verification, reputational feedback systems and similar devices. In small-scale grassroots settings, vernacular legalities are once again important. Yet it is fair to say that around the prevention of harm, there is a lot more overt contestation, and as a consequence a much greater likelihood that formal state law is invoked, whether through regulatory lobbying or direct litigation. Both have been rife in relation to those instances when serious harm has flowed from the unfounded trust of an accommodation host or a ride-share provider. Where could the pathways of legal imagination lead to? Belonging, harm and care, then, are the lines along which we can start to reimagine the ways law can foster interaction, keep harmful extraction in check and stitch together more humane and sustainable forms of collective organisations. These kind of imaginings will take root at a systemic level only if the trajectories they gesture towards attract a critical mass of enthusiasts—Botsman and Rogers’ fourth element. And here, it is vital to bend the sense of critical mass away from sheer volume of potential consumers—a kind of market research tipping point—and towards a more systemic understanding of critical mass, one that perhaps understands it as shared infrastructure for emerging forms of economic and legal reconfiguration. As Fleur Johns has put it, we need to “recognise law as a field for making and remaking things, ideas and relationships…[for] the painstaking, collaborative unstitching and re-stitching of how we see the world, how we relate to one another and how we might yet do so.” Work such as Janelle Orsi is doing could multiply and mushroom to produce such an effect, and the proliferating networks and coalitions around alternative economic trajectories may soon include more overtly legal ones. To really keep the extractive economy in check, however, and preserve the plural possibilities buried in the sharing economy, we need more than a regulatory approach. We need grassroots legal imagination, a thousand flowers blooming from the seeds sowed by reimagining legal interventions along lines crafted by belonging, harm and care. Stitched together into shared infrastructure for a new economy, these lines could transform business lawyers into less unlikely activists. Bronwen Morgan is a researcher exploring legal and regulatory support structures for social activists and social enterprises responding to climate change in Australia and the UK, funded by a Future Fellowship from the Australian Research Council.